When ski touring mountainous terrain with consistent no fall zones, or when negotiating early morning ice or boot-packing a steep couloir, it is nice to have assurance that a simple slip won't lead to a potentially life threatening injury. 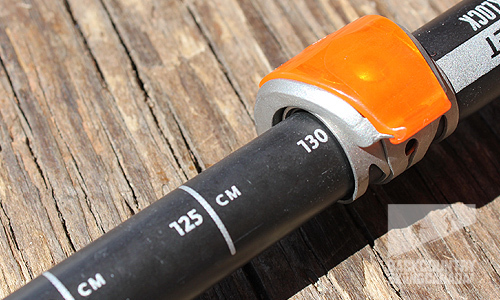 Black Diamond's Whippet Self Arrest Ski Pole is just the tool to ease your mind in these situations. 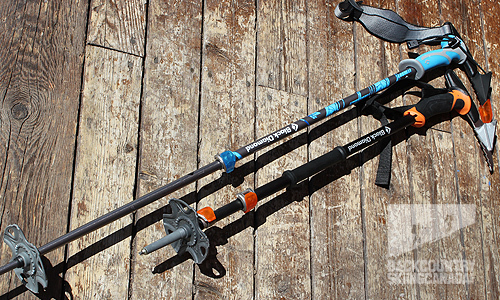 The 2012 (blue) & 2013 (orange) Whippet Ski Poles. Being new to touring I was extremely grateful to have just one of these poles in my hand while exploring British Columbia's Kokanee Glacier Provincial Park. I lost my footing on a number of occurrences and I shutter to think what might have happened if I wasn't able to dig the canard wing of the pick into the snow. Even while traversing up ice slopes, I was marching confidently knowing I had the proper self-arrest tools. 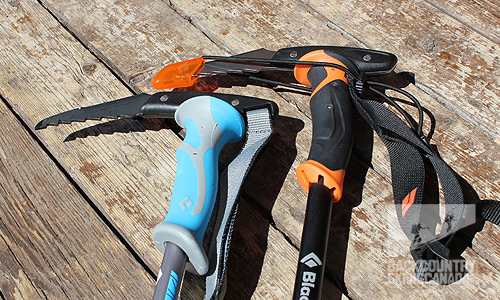 The protective cover comes with an adjustable cord to ensure the ice pick will stay covered when not in use. The aluminum shaft and touring series grips keeps it lightweight and the stainless steel ice pick ensures it will stay resistant to rust during those coast mountain tours. 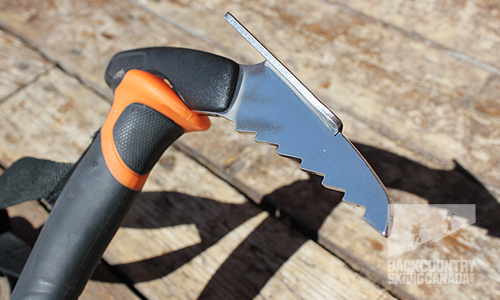 Stainless steel canard wing & ice pick adds safety to your backcountry tools. The 2013 model comes with improvements including an ergonomic design on its top end adding comfort while using in cane mode. 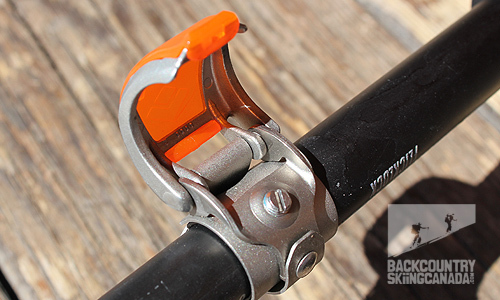 Although sold individually you can choose between the regular or Carbon Whippet, and although the Carbon is more expensive it comes with 2 FlickLock Pro snaps as opposed to one, making it more compact. The lower hand grip on the 2013 model appeared to stay in place better then the 2012, and is a nice feature for a lower grip option and/or cross chest self arresting. Secondary, lower grip helps with the cross-chest self-arrest technique or choking down on the uphill. Whether heading up or down, piece of mind is given when this item is in your grasp. 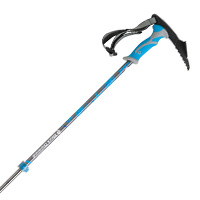 With only one, remember to be holding it in your uphill hand if traversing a slope, choke up on the pole and use the lower grip, but I recommend keeping the strap around your wrist while in hazard zones. Much like the AvaLung, it's useless unless ready. 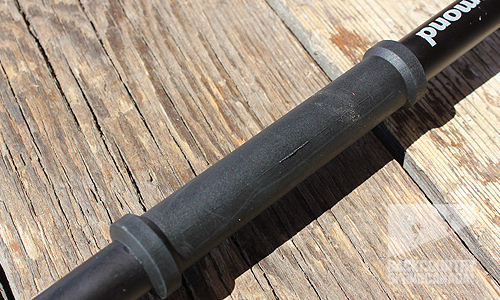 FlickLock clips are low profile but duel axis to provide exceptional strength with little notice. Five centimeter intervals help mark pole length and helpful for snow layer analysis. 100mm powder basket, because well, you don’t tour for hardpack. - Self-arresting & climb assisting Cro-Moly ice pick with protective cover. - Canard wing for extra breaking force. - Comfortable Touring Series grip & secondary lower grip. - 100mm/4 in powder basket. 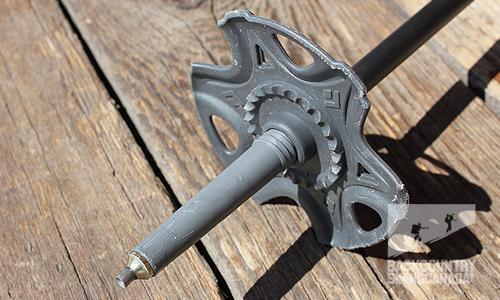 - Duel Axis FlickLock Pro snaps for adjustability and clamp strength. - Carbon: Duel FlickLock Pro for more compatibility. - 5cm interval measurement markings. Because these poles are sold individually you have the option to arm yourself with just one. Having two would eliminate the need to switch poles from hand to hand at every switch back, and the thought of additional security is comforting. However I was quite satisfied with just one at all times. It is much easier to keep track of where one adze is while sliding uncontrollably down a steep, decreasing the risk of puncturing yourself. I prefer the duel FlickLock as opposed to the single to keep it compact in my pack while off the especially steep slopes. 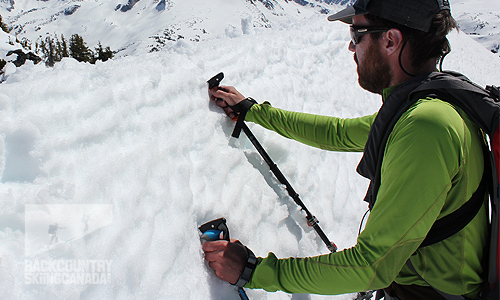 Like many pieces of equipment we carry into the backcountry, the Whippet ski pole is a precautionary item for those "just in case" moments. Knowing the Black Diamond Whippet is in my hand and that it could stop a long slide gives me confidence and enables me not to be deterred by the 'what if' question. - Very comfortable in the hand while touring. - Added safety for more advanced terrain. - Clamps are low profile but extremely strong. - Not much options for protecting yourself from puncture wounds.